ain rain go away used to be my mantra as well, that is, until I learned how to accessorize for rain properly. There are those $3.00 umbrellas you can buy on the street (and I've bought my fair share) and then there's umbrellas. Real umbrellas. And once you get into those, there's no turning back. Take a wild guess where the best umbrellas in the world come from... I'll give you a hint: They have really crappy weather. If you guessed England, you're following along perfectly! 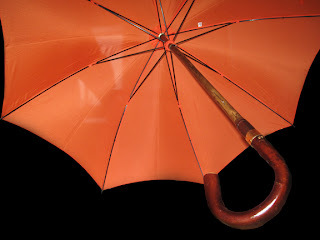 There's a company in London that has been making umbrellas since 1750. I've mentioned them before in passing: it's Swaine Adeney Brigg. As you might imagine, with over 250 years of experience in one of the rainiest, crappiest, most foul weather parts of the world, they've gotten quite good at it. It's good enough for the Queen at least, and one might imagine that she is a very discerning woman. Brigg's best umbrellas are those that are "full stick" meaning that the handle and shaft of the umbrella is made from a single branch. They sell those and two piece umbrellas, but if you're going to do this right then go solid. As far as their selection of hardwoods, I doubt it can be surpassed. There's oak and cherry and chestnut and ash and maple and hickory and more. Some have the option of leaving the original bark on the handle, while others are polished. There's a good range of canopy options as well from nylon to cotton to silk. Plaids and solids. You can customize the length, choose from gold or silver collars, get an end cap for the handle. You can order the umbrella cover, have the collar engraved, and even get different color fabrics for each frame in the canopy. The possibilities are endless. I ordered my umbrella in February this year and opted to go bespoke. I chose a standard size 26 umbrella (suits me well) that is bark chestnut. I love the feel of the bark and I think it gives a better grip. The chestnut color is outstanding, and the difference in color tone between the bark handle and the stripped shaft is amazing. I went with a nylon canopy since I wanted a color that was not available in silk. It's a pretty bright orange. There were two oranges available, and the colors looked different from monitor to monitor. I imported the fabric swatches into Photoshop and measured the RGB (Red, Green, and Blue) values for both oranges, and ended up taking the one with higher red values. As I mentioned, the standard collar options are gold plate or sterling silver. 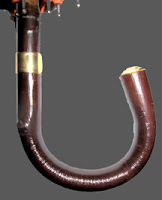 I didn't like either for this umbrella, and had them make the collar from solid brass instead. 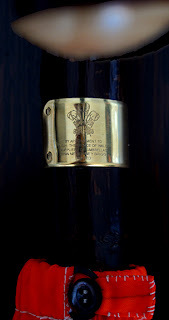 No engraving (I remember my name) so just the standard royal warrant. I'm looking forward to the collar oxidizing some. Thank you very much for your order. We are delighted to assist you and appreciate the opportunity to do so. Thank you very much for interest in our fine goods. We are delighted to assist you and appreciate the opportunity to do so. We have enquired with the Swaine Adeney Brigg factory in England in regards to a completion date. We will forward you our findings once they become available. No, I did not find that information helpful. By May 27, I was certain to inform them of that. On June 2, I was notified that Swaine Adeney Brigg had run out of bark chestnut shafts, and that they were attempting to source them. Estimated arrival: mid June. By June 29, patience had worn thin, and my followup emails were beginning to reflect this. On June 30, I was informed the shipment (that might include my umbrella) was delayed. Perhaps it will arrive the following week? On July 6, I was finally notified that they had the umbrella in hand, and were ready to then ship it to me directly. Sore points aside, the arrival of the umbrella was something to behold. It came in a long, slender box something like a box of long-stemmed roses. Inside, Swaine Adeney Brigg tissue with a gold seal sticker. Under that, a SAB umbrella bag with a bow tied around the handle. Inside of that, the umbrella sealed in plastic. Inside of that, the most magnificent umbrella I have ever held. This will not be my last; I plan to get others!